Here it is: my worn, well-loved copy of the Gabriel Knight: Sins of the Fathers novelization (ROC, 1997). I like this cover. I especially like how a grainy still from the game’s FMV sequel has been superimposed onto it (Gabriel Knight II itself was filmed against a blue screen, so the cover art is an homage, I guess). As for the book itself, I wouldn’t say it’s awful. For what it is—a novelization of a voodoo murder mystery PC game—it’s pretty good. It’s pulpy, a little hardboiled and over-the-top. During the action, sure, it’s a real clunker: entire paragraphs play out procedurally, as if this were a strategy guide instead of fiction. The expository dialogue is pretty good, though. Apparently, Crash had. He began to weep, quietly and hopelessly. The tears that pressed between his fingers were pink. ”’S that the last straw, you think?” Gabriel asked quietly, when the boy would not stop. The boy nodded inconsolably, his face still hidden in his hands. The boy nodded again and hitched his breath, his crying raising a notch in sorrow. Gabriel wanted to put a hand on the kid’s shoulder, but he was supposed to be playing the bad guy and for some reason, he was sure he had to. Besides, he didn’t want to get too intimate with whatever disease it was that was eating this kid alive. Gabriel Knight: The Beast Within, the novel, was published the following year. You can find either book online for about a buck. Ah, the game cheat: it’s pure magic. The following is a screenshot from Timothy McSweeney’s Internet Tendency. The article itself, “Video Game Hints, Tricks, and Cheats,” was published in 2002. It’s pretty weird. Oh, it gets sillier. Much sillier. 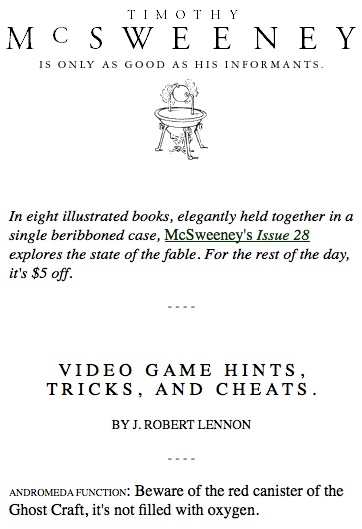 McSweeney’s – Video Game Hints, Tricks, and Cheats.